Robo Siksha Kendra is an unprecedented CSR approach conceptualized by India STEM Foundation to nurture young minds to become innovators of tomorrow for STEM (Science, Technology, Engineering & Mathematics) Education with the intervention of Robotics and project based Hands-on learning activities. Students are engaged into the learning process using hands-on robotics activities platforms to instill scientific temperament and foster innovation & creativity. The hands-on activity designed are in-line with NCERT National Curriculum Framework. Robo Siksha Kendra approach is in alignment with the mission of MHRD Rashtriya Avishkar Abhiyan, NITI Aayog Atal Tinkering Labs and PM Skill India projects. Engagement throughout the year, year after year. DLF Foundation, Maruti Suzuki, FORD & Endurance International Group have supported with us through their CSR initiative to adopt more than 11 schools for the establishment of Robo Siksha Kendra. We have been able to teach STEM education to 6000+ underprivileged students via hands-on robotics platforms with help of these corporate CSR support. 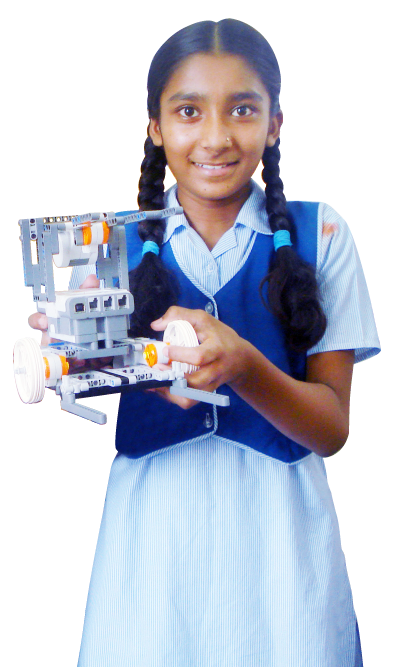 The Robo Siksha Kendra establishment at underprivileged schools equip the students with necessary kit of parts & coaching required to exhibit their talent at global competitions like World Robot Olympiad, FIRST LEGO League. However, the students’ participation is often hindered by costs that incur towards registration fee, additional preparation elements, travel & accommodation etc. The financial support for these costs shall promote the deserving students to showcase their skills at the competitions. The supporting organization will have multiple opportunities for creating branded merchandise for the teams (t-shirts, caps, robot, accessories etc.) along with deliverables associated with team sponsorship. Enter your email to get latest update of our programs.